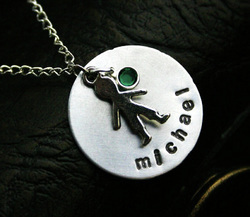 'Michael' Necklace - 1' Solid Disc with Charm and Swarovski Crystal. Up to 24 characters (including spaces) can be stamped. Available in your choice of Sterling Silver, Copper or Aluminum. Sterling and Aluminum come with 18" Sterling Box Chain, Copper comes with 18" Copper Chain.